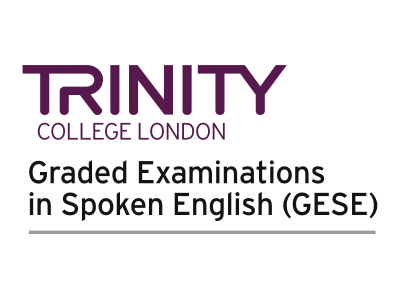 Trinity’s GESE exams are designed to complement general English language courses, and exam preparation focuses on the development of communicative skills and building confidence among candidates. The Conversation: An opportunity to demonstrate a realistic exchange of information, ideas and opinions at an appropriate level for the grade. The Topic: Before the exam, the candidate prepares a topic of their choice – this is used as the basis for discussion and as the basis of a presentation at Advanced stage. The Interactive task: A prompt from the examiner initiates candidate-led speaking and listening interactions – requiring an authentic exchange of information and opinions. The Listening task: Short, spoken passages prompt the candidate to demonstrate prediction, deduction and inference skills (only at Advanced stage). As they move up the grades, candidates undertake tasks that require a more advanced use of language. At higher grades, they are expected to take more responsibility for developing and directing the conversation, rather than simply responding to a series of questions. What are the Graded Examinations in Spoken English (GESE)?